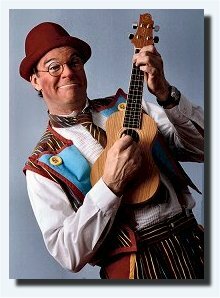 John Hadfield is an actor, clown, and musician based in Wilmington Delaware. John attended the University of Delaware, getting a degree in Russian language, and while there discovered the art of clowning and circus skills. After college John enlisted in the army, and during basic training was procured by the White House Communications Agency, and worked with President Carter in the White House, and played an important role at the Bonn Summit, the Tokyo Summit and the Begin-Sadat peace talks at Camp David. In 1982 John graduated Ringling Clown College, then toured for two years with the Royal Lichtenstein Circus. He partnered with clown Chris Shelton to form the Crash Brothers, with John playing the role of Crash the Clown, and Chris playing Officer Offbeat The Clown. John also toured solo shows as Crash. As Crash, John has performed at a number of places, including the White House (twice), Disneyland, and Magic Land in Bangkok Thailand. John spends his free time competing in dog agility with his (Akita) dog Kenny, is a black belt in aikido, and ski races with the Wilmington Ski Club. 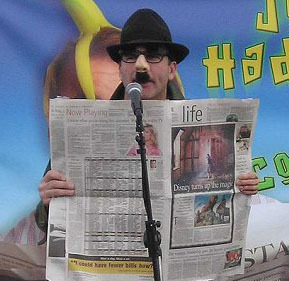 Besides Crash the Clown and The Crash Brothers, John performs a science show, as a stiltwalker, his newest program is a set of kid’s songs and comedy entitled John Hadfield in Concert. John’s music CD’s Monkeys In The House and Robot Monkey Head are available online. You can purchase them from Amazon.com by clicking on the album covers below.